A ruling by a federal panel Friday concluded a decade-long highly publicized and stormy controversy involving a former MIT researcher accused of falsifying research data and Institute Professor of Biology David Baltimore '61. The panel found no evidence of scientific fraud and exonerated former Assistant Professor of Biology Thereza Imanishi-Kari, who was accused of fabricating crucial data for an April 25, 1986 Cell paper that she co-authored with Baltimore. "I believe this is a victory for science and rational analysis," Baltimore said. "The sad thing is that it took two judges and a retired scientist to undo the work of a `scientific' office," Baltimore added, referring to the findings against Imanishi-Kari by the Office of Research Integrity, which the federal ruling panel rejected. Baltimore, though never accused of any scientific misconduct, was a staunch defender of Imanishi-Kari and a critic of the government's investigative processes. His vigorous role earned him strong criticism during years of investigations by a number of groups -- including the National Institutes of Health -- which found Imanishi-Kari guilty of wrongdoing. The decision of the panel, the Research Integrity Adjudications Panel of the Department of Health and Human Services, is likely the last one to come on this case. "As far as I know, there is no process left that can happen," Baltimore said. Baltimore, a leading biomedical researcher and pioneer in virology, was awarded the Nobel Prize in physiology or medicine in 1975 for his discovery of reverse transcriptase, an enzyme essential to the replication of many virus, including HIV. The findings in the 1986 Cell paper were originally challenged by Margot O'Toole, then a post-doctoral researcher in Imanishi-Kari's laboratory. O'Toole, who is now a researcher at the Genetics Institute, a biotechnology firm in Cambridge, expressed disappointment at the ruling. Almost every scientist who has looked at the evidence has concluded that there was fraud, O'Toole said. But the administrative law panel that handed down the decision "decided the evidence was irrelevant," she said. "It's not surprising that they ruled there was no evidence" of fraud, she said. The Cell article reported results of experiments on mice that seemed to indicate that the introduction of foreign genes into an animal could lead to the expression of related genes in the animal, a matter still under debate. Such a finding could have implications for immunological study and gene transplant work. O'Toole had been repeatedly unable to reproduce Imanishi-Kari's promising results and was suspicious of her data published in the Cell article. She claims that her challenges to Imanishi-Kari and Baltimore over the data went unsatisfactorily answered. "I've considered it to be over so many times," O'Toole said of the controversy. "I just don't know." Others were pleased with the decision. "It was clear to colleagues close to Thereza and David for the past 10 years that they have always been honest scientists doing interesting research," said Head of the Department of Biology Phillip A. Sharp. "We celebrate the decision of the appeals panel in confirming the situation. We are particularly glad for Thereza, who has suffered enormously due to her exclusion from funding by NIH," Sharp said. Imanishi-Kari is currently a researcher at Tufts University. At the time of the Cell article in 1986, Baltimore was the director of the Whitehead Institute for Biomedical Research. He left his position in July of 1990 to become president of Rockefeller University in New York. But he remained at the post only 18 months, and reluctantly resigned in the face of mounting accusations and controversy surrounding the Cell data. 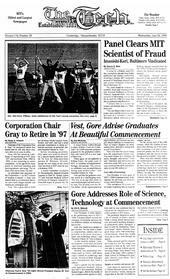 Baltimore returned to MIT in 1994. Baltimore, who has long pursued an active role in public debates and advisory committees dealing with science and public policy, was vocal in his opposition to the investigations and accusations against Imanishi-Kari. Baltimore and many others believed the process raised much larger questions about the government's right to police research. Congressional investigations led by Rep. John D. Dingell (D-Mich.), which at one point employed the Secret Service to look into alleged forgery in Imanishi-Kari's data notebooks, struck some as more of a witchhunt than an attempt to settle a scientific dispute. Many in Congress used the case as an opportunity to call into question the validity of scientific research. In a letter he wrote to colleagues in the spring of 1988, Baltimore accused attackers of using the controversy to "cripple American science." "I've often asked myself if there's anything I'd have done differently," Baltimore said. "Aside from small minor matters, I don't see how I could change the course of events." "I feel very good that I stood by [Imanishi-Kari] and that her integrity is no longer impeached," he said. The controversy sparked debate at MIT over its own policies on academic fraud. In 1990, though not directly in response to the Baltimore controversy, the Institute created a more thorough policy that now requires formal, written reports during all steps of an investigation. MIT's internal investigation of the matter had concluded that Imanishi-Kari was not guilty of misconduct. Imanishi-Kari could not be reached for comment. David D. Hsu contributed to the reporting in this story.